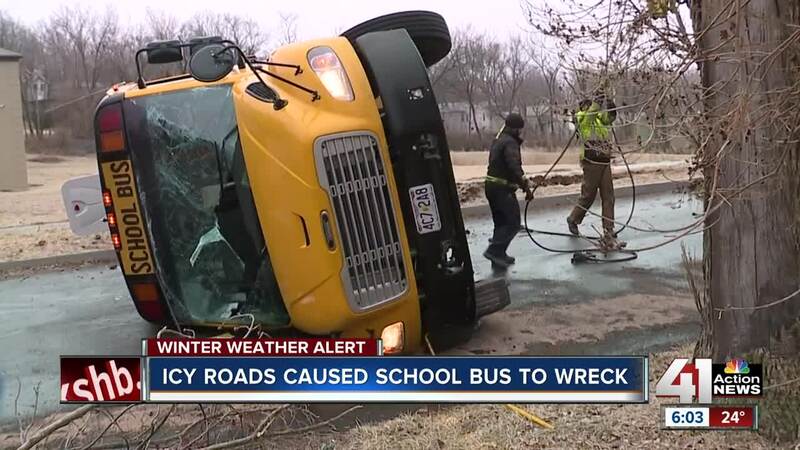 Icy roads could be to blame for a school bus that lost control and flipped over Wednesday afternoon in Kansas City. First responders were called out just before 12:30 p.m. to the overturned school bus. Three students, including one in a wheelchair, were on the bus at the time of the crash, but they were not seriously injured, Center School District spokeswoman Christina Medina said. "We really found it was the neighborhood streets and side roads where our buses were having issues maneuvering the roads," Medina said. A manager at a nearby apartment complex who witnessed the crash said buses are "always flying by over here and dropping off the kids." "Today when it's icy, you can see it on the video, just ran and just flipped," Tomer Badash said. Street crews were out treating slippery roads on Wednesday afternoon. The metro is in an Ice Storm Warning until noon Thursday.